We will be teaching you how to use Kindle fire as Second PC Screen in order to get more room to work on or just increase your viewing experience. Kindle Fire is an e-reader tablet based on the Android operating system from Amazon. The device can be used to browse, buy, download and read e-books, newspapers, magazines and several other digital media via wireless networking to the Kindle store. The 7-inch screen is very idle for all these which makes it the very best among its competitors. However, you can do much more than just browse, buy, download or read ebooks, newspapers, magazines etc. For example, you can use it as your second PC screen. We will be teaching you how you can achieve this through two different methods. iDisplay is an app on the google play store that mirrors your Android screen to your PC giving you, in their words “more screen real estate”. Thankfully, the Kindle Fire tablet runs on the Android operating system so it should work without any hassle. However, the Software on the google play store isn’t free and you will have to buy it. Mac OS 9 or Higher. Go to the Google Play Store and Download The iDisplay App for Android on your Kindle Fire. Download the iDisplay Software for your PC or iDisplay Software for your Mac and run the software. Make sure both your Kindle Fire Tablet and your PC/Mac is connected to the same WiFi network. Open the iDisplay App on your Kindle Fire Tablet. From the options, Find your computer and select it. That’s it. Now your Kindle Fire Tablet is been mirrored to your PC/Mac or rather, you are using Kindle Fire as Second PC Screen. You can now control some certain things using the software on your PC. This is kinda of the same with iDisplay but it is far cheaper offers somewhat the same features. It cost less $10 on the Google play store. 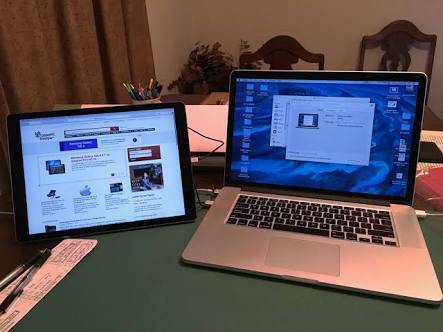 Visit the AirDisplay Website to download the Software for your PC or Mac. You can also download the App for your Kindle Fire Tablet on the website or go to your Google Play Store and Search for “AirDisplay 2“ then download. Make sure both your PC/Mac and your Kindle Fire Tablet is connected to the same WiFi network. Run the software on your PC and then open the app on your Kindle fire and Choose your PC/Mac to connect. That is how to use Kindle Fire as Second PC Screen. There are other ways you can achieve this but these are probably the best way to go about it wirelessly. You can also play around with the settings to suit your taste. For example, you can reduce the picture quality to make the mirroring faster. Got questions? Leave a comment down below.